TAN Books and author Jean M. Heimann have just released a gorgeous new book, written in honor of the Centenary of Fatima, that helps teens and adults fully grasp the significance and power of the apparitions of Our Lady at Fatima: the miraculous events of 1916 and 1917, the messages, their meaning, and their impact on souls. AC: Hi Jean! Tell our readers a little bit about this exciting new work. JH: Fatima: The Apparition That Changed the World is the true story of three shepherd children who, in 1917, had visions of the Blessed Virgin Mary in the mountain village of Fatima, Portugal and met with her on six different occasions. Our Lady asked them to pray the Rosary daily and to offer penances and sacrifices for the conversion of sinners and for world peace. In my book, I present a comprehensive look at the Fatima apparitions, offering a chronological timeline, describing each of the apparitions in detail, tracing the lives of the three visionaries, as well as the death and beatification of Jacinta and Francisco Marto, and revealing the ongoing message of Fatima for the past one hundred years. I also share a history of the various popes from 1917 to the present and describe their relationship with Fatima, as well as some of the modern day miracles that have happened since then. In addition, I explain why the Fatima message is relevant to us today and how we can put it into practice. AC: What prompted you to write the book? JH: I made my consecration to Jesus through Mary about twenty years ago. I was just beginning to grow in Marian devotion at that time; although, when I was a child, we prayed the Rosary daily and my mother was always turning to her heavenly Mother in time of trial. The Brothers of St. John attracted me to their community through the Marian consecration, via the St. Louis de Montfort method, which they taught in a group setting, providing spiritual guidance. I was then drawn to become an oblate with the Community of St. John in Princeville, Illinois and to entrust my life even more deeply to the Blessed Virgin Mary. As a child, I grew up in a small French-Canadian town in northeastern Illinois and was well-acquainted with Our Lady of Lourdes. Every day after school, I visited the Lourdes grotto behind our parish church and prayed there, sharing my concerns with the Blessed Mother. I learned about the Fatima apparitions, but they did not stick with me the way the apparitions at Lourdes did. I do, however, remember watching the 1952 movie The Miracle of Our Lady of Fatima, which left an impression on me. As an adult, I became re-acquainted with Fatima by watching EWTN. I decided to join the Blue Army, and through this organization began practicing the First Saturday devotions and praying the Rosary daily. About a year ago, I realized that 2017 would be the 100th anniversary of the Fatima apparitions and thought that this would be an interesting topic to write about. Last fall, I founded the Our Lady of Fatima Rosary and Study Group in my parish, and we began meeting in my home, where we studied the Fatima apparitions and prayed the Rosary. AC: What did you learn from writing this book? JH: I learned what a powerful apparition Fatima is! The conversion of the world and world peace are dependent on our fidelity to its prayers and devotions. It is through devotion to the Blessed Virgin Mary and her Immaculate Heart, as well as through the recitation of the Rosary, that we will experience an end to the culture of death and obtain world peace. Pope St. John Paul II has stated that the message of Fatima is even more relevant today than when it was first given to the visionaries in 1917. I also learned about the details of the wonderful miracles that have taken place in connection with Fatima since the initial apparitions in 1917. AC: What did you enjoy most about writing this book? JH: I enjoyed using my imagination and my five senses in depicting the apparitions. I enjoyed viewing things from the vantage point of the children, the Angel of Peace, the Blessed Virgin Mary, and the other characters in the book. For example, I loved writing about the spectacular miracle of the sun, describing the wide array of colors of the sun and the earth, how the sun was seen as a silver disc and began spinning around. I imagined how beautiful and frightening it must have been at the same. In my mind’s eye, I put myself in that crowd of spectators, watching the sun fall from the sky, fearing that this was the end of the world, hearing those around me confessing their sins aloud and begging for mercy. AC: Who is your target audience? JH: It’s written for adolescents and adults, both Catholic and non-Catholic, who want to learn more about the Fatima apparitions, put its message into practice, and have a beautiful family keepsake to treasure for years to come. 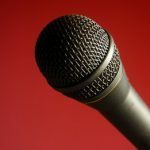 AC: What are the benefits of studying the events and message of Fatima, as presented in your book? JH: This book can help readers to live the message of Fatima: prayer, penance, and devotion to the Immaculate Heart of Mary. Her message draws us into a deeper, more intimate relationship with the Mother of God and helps us to perform a crucial role in changing the world from a culture of death into a culture of life. Order Fatima: The Apparition That Changed the World, here. 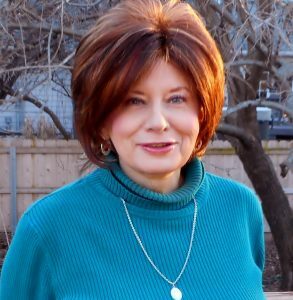 JEAN M. HEIMANN is a Catholic author and a freelance writer with an M.A. in Theology, a parish minister and speaker, a psychologist and educator, and an Oblate with the Community of St. John. She is a member of the Blue Army and founder of Our Lady of Fatima Rosary and Study group. Jean is the author of Seven Saints for Seven Virtues (Servant, 2014) and Learning to Love with the Saints, A Spiritual Memoir (Mercy, 2016). 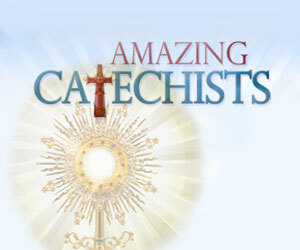 Visit Jean at her website http://www.jeanmheimann.com/ through which you can access her award-wining blog, Catholic Fire. 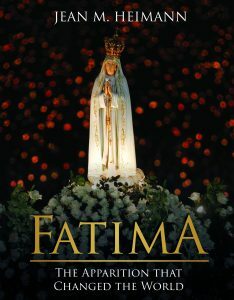 Her new book Fatima: The Apparition That Changed the World is available for pre-order at Amazon.com or at TAN Books online.